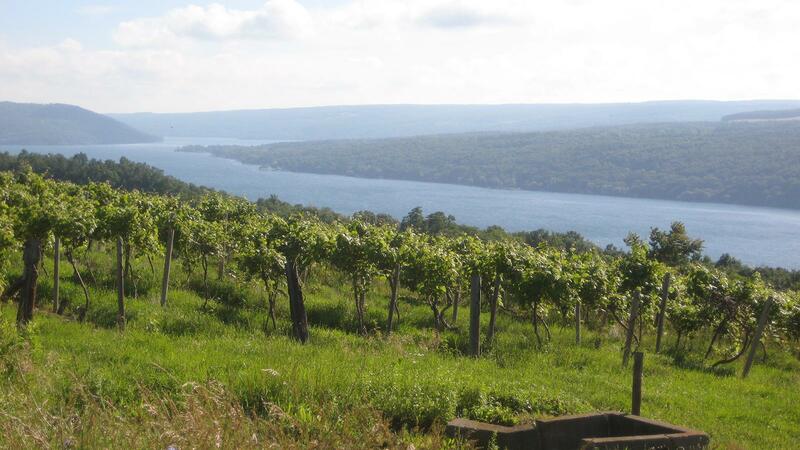 Keuka Lake's vineyards pitch down toward the winery's namesake. Mel Goldman figured one thing out right away when he started Keuka Lake Vineyards in the Finger Lakes: Riesling. Tours to the region as a wine enthusiast brought him into contact with the wines. He took bottles back to his friends for a tasting group, and tasted blind against Rieslings from Germany and elsewhere, the New Yorkers prevailed. So that's where he put his focus first. Located just up the western side of Keuka Lake, Goldman's winery and tasting room is nestled among a small set of unassuming white buildings. What pops visually is the vineyard just below the winery, a slightly flat portion of gravel, clay and silt over shale that drops off dramatically. The top portion was planted in 1998, and this 1.5-acre section is known as the Goldman Vineyard. Below, the more treacherous 1.3-acre pitched portion is the Falling Man vineyard. (See what he did there?) Just to the northern edge of both lies the gently sloping Evergreen Lek vineyard, a 3-acre parcel that's less sloped and bordered by a prodigious set of pine trees. All three are vinified separately, and in the 10 years since starting his winery, they've developed a track record for producing some of the region's most distinctive, and ageworthy, dry Rieslings. "The Goldman is the one with the most obvious fruit," says Goldman. "Evergreen Lek is more austere, while Falling Man is," he pauses, searching for the word. I offer up "bony" and Goldman agrees. "Exactly, bony." In the vineyards, the season has been dry so far, but vegetative growth and fruit set has been splendid. In fact, the crop looks a little too good, and Goldman plans to start bunch-thinning soon. All the viticultural work is done by hand here—getting mechanized labor through the steep slopes is too difficult. Watch the accompanying video as Goldman details what's next on the to-do list in the vineyard this season. The first vintage for KLV was 2005, made by Ravines' Morten Hallgren at another facility. By 2006, the wines were made in-house. Staci Nugent was the first full-time winemaker, followed by Ian Barry. Since 2015, 27-year-old Katie Larwood, a San Francisco native who got the Riesling bug after working in New Zealand and Alsace, came on board. "I e-mailed him first," says Larwood, climbing down from atop a stainless-steel tank in the winery's cramped cellar. "I had read a bit about the Finger Lakes and wanted to come here, even though I had no experience in the area." A few FaceTime chats at odd hours—she was working in the southern hemisphere at the time—and the job was offered. Nugent still consults. "We aim for a sort of Japanese-style consensus when tasting lots and doing the blends," says Goldman. Since my last visit here in 2011, Goldman has added a few more smaller tanks. A new press pad is being built as well. Steps have been taken with the winemaking too—there's little to no back-sweetening anymore, and better temperature control has been installed. It's all bit by bit in the winery. The operation has grown outside as well, producing an average of 3,500 cases annually from 45 acres of vines. Goldman has added a parcel on the east side of Keuka, planting Riesling, Pinot Noir and Vignoles in recent years. "We're not a rich man's winery, so we make little steps each year," he says. Those little steps all add up over time. And they all seem headed in the right direction at KLV. Mel's a good guy making nice wines, my favorite being the Falling Man - as good as any Riesling made in the Finger Lakes except for possibly the HJW vineyard from Weimer.